First of all, there are three dragons: Dinraal, Farosh and Naydra that are roaming over Hyrule. Naydra is the Blue Spirit of Mount Lanayru and keeper of the Spring of Wisdom. 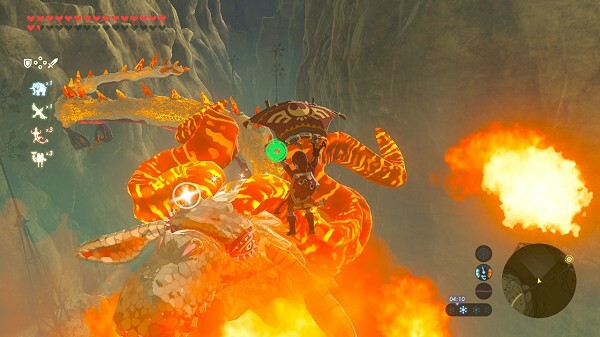 Dinraal is the Red Spirit, roaming between Eldin and Tabantha. Farosh is the Golden Spirit, flying over Faron and Lake Hylia. An important thing to know about these dragons, is that you don't have to wait for them to come, you have to "wander around" for them to appear, but you can still "wait next to a fire" to make time pass. When you spot one, you can't warp to buy some time. The most important thing is to find a place higher than the one the dragon is going through. That way, when the dragon is going below you, you jump and fall (or go down with the Paraglider, or use the wind currents that the dragon generates). That way, when you shoot an arrow, time goes in slow motion and it's way easier to aim! If you own it, use the Ancient Bow that shoots arrows nearly in a straight line, making it a lot easier to aim! The Shard of Horn is the most powerful item, allowing you to create potions lasting 30 minutes. You can know what you've hit from the sound. As a matter of fact, hitting the horn doesn't make the same sound as a scale does! Each of these dragons descends from the sky or gets out of a lake at a certain time, goes a certain path, then goes back up in the sky. From my (little) experience, you can't tell that a given dragon will certainly be at a given place at a given time. It depends on which place you are at this moment as well. It appears to me that if you are at a place where it often appears at that given moment of the day (morning / evening), then it will quickly appear at this place. At night (so from 9 PM on), Farosh comes out of Corta Lake and flies above the waterfall to the south. Stand on one of the sides or atop the waterfall to hit it. You can also arrive earlier, set a campfire under a big tree (in order to avoid the rain), and wait for morning to come. The dragon appears as soon as the campfire is put out. Other location: at night (from 9 PM on), be at Rassla Lake (southeast of the Lakeside Stable). The dragon quickly climbs up the waterfall, wait for it to be at the bottom of the waterfall to leap in the air and aim at the chosen part or use Revali's Gale. Other location: at night, warp to Lake Tower, then fly towards the Bridge of Hylia's south tower. Wait a bit until Farosh comes by, leap into the air and immediately shoot your arrow. Other tip: Wear the twice upgraded Rubber Armor to avoid the electricity balls thrown by the dragon (as well as the thunder). At night (so from 9 PM on or later), Dinraal descends from the sky around the snowfield (not quite sure) and wanders in the canyon to the south until the bottom of it. It notably goes under the Tabantha Great Bridge, and by standing in the centre of the bridge, it's rather easy to hit it. On this same path, you can also reach it from the edge of the canyon, on the eastern side not far from the Serenne Stable or on the western side not far off Hebra Tower. Once it's facing you, jump and shoot your arrow. Another location but less easy according to me: at dawn from 5 AM on, it descends from the sky around the Eldin Great Skeleton, northwest of Death Mountain. By standing on the skeleton, you can reach it, but beware of the wind currents that can make the loot fall off! Other tip: Wear the twice upgraded Flamebreaker Armor to avoid the fireballs thrown by the dragon. 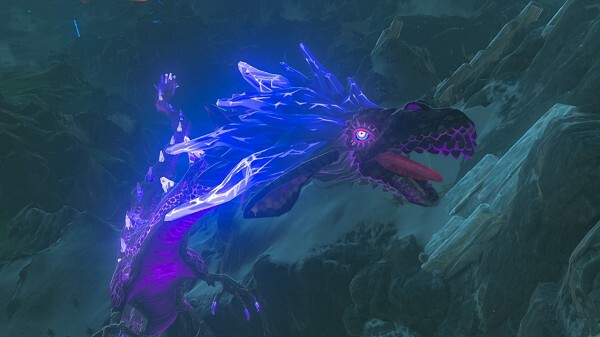 Note: This dragon must first be saved on Mount Lanayru: see the sidequest "The Spring of Wisdom". 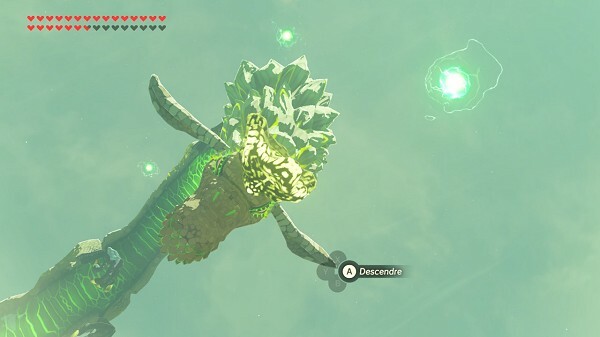 At night or at dawn from 5 AM on, Naydra descends from Mount Lanayru and wanders towards the Lanayru Promenade through the two Lanayru Roads (West and East Gates). Be at Lanayru Gate (the "East" one, where the Memory no 15 is) on the ark. Naydra quickly goes under those arks. Other location: at night, from the Rucco Maag Shrine in the Lanayru region (next to Ruta once you've calmed it down), get out of the brambles field and go south until you get next to a lake (Lanayru Bay). Go on your left (so with the lake on your right) and keep going for a bit until you climb the highest rocks over the lake (right before a small beach). Wait a few moments to see Naydra coming from the right. Wait for it to be right in front of you to jump and shoot your arrow. Other location: at night, warp to the Spring of Wisdom, on Mount Lanayru, then paraglide to the northeast towards Wintre Island. Along the way you'll meet Naydra going up towards you and you just have to shoot your arrow. Other tip: Wear the twice upgraded Rito Armor to avoid being frozen by the ice balls thrown by the dragon. Thanks a lot to Luna4, Bouboucam, Sani', Toma531 and Mickael!